Moss and Lam created a series of feature artworks that play a major role in animating the home for Canadian athletes and their families at the 2016 Summer Olympics in Rio, Brazil. 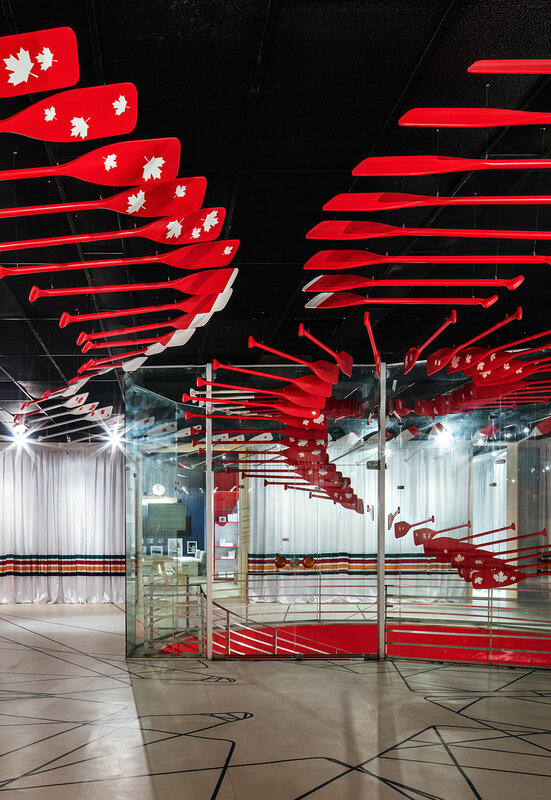 The installation was a major undertaking working with our design partners, Yabu Pushelberg, along with Olympic sponsors Canadian Tire who supplied the materials. Canoes were commissioned from South Street Boatbuilders. There was a total of 108 custom painted paddles suspended from the ceiling. Our team engaged students at Etobicoke School of the Arts who came for a day to our studio – cutting and gluing thousands of strips of the material that comprises the giant Canadian flag, the focal point for the celebration room. Cyclist Hugo Barrette came by the studio to lend a hand. Click the video link to see how it all came together.